The word ‘Mother’ exhibits the same purity and integrity, which the word ‘Yoga’ reflects. She forgives all your mistakes and will stand by your side no matter what comes your way. Yoga takes care of you like a mother. It takes care of you internally and while continuous efforts are being made to restore and retain your external zeal by bringing you closer to the truth—ALMIGHTY. It has the power to open a world of opportunities as Yoga is about ‘ME’ and not materialistic pleasures. Yoga, an ancient science of India, in 2015 gained recognition across the globe after ‘June 21’ was declared ‘International Yoga Day’ by the United Nations General Assembly (UNGA), with 177 nations supporting the resolution. Celebrated with lots of passion in every corner of the world, June 21 is the longest day of the year. It shares a special significance as it is said that ‘Shiva— The Adi Yogi’ commenced enlightening mankind with the yogic wisdom on this very day. Keeping in line with the significance of the day, 3rd International Yoga Day was celebrated at Kairali Ayurvedic Centre, Mehrauli, New Delhi with an invincible gusto. The day witnessed a special session being held on the need of adopting yogic lifestyle to maintain the equilibrium between body, mind, and soul to live a meaningful life and be at ease with oneself. The expert also explained the need to listen to your inner-self to heal and to let oxygen flow through those blockages that till today had stopped you from achieving optimum health. Employees, associates, management and guests present at the centre were seen practicing yoga asanas. The day saw yoga enthusiast dawning a special T-shirt designed for the day. 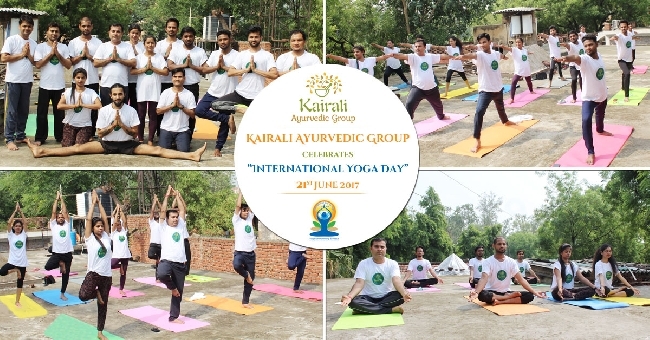 An annual fiesta at Kairali Ayurvedic Group, International Yoga Day is celebrated with lots of enthusiasm and fervor as it marks an extraordinary beginning to the beautiful union of Yoga and Ayurveda. In a bid to help people instill yoga as a lifestyle, Kairali Yoga classes are as well organized in Kairali Ayurvedic Centre, Mehrauli, New Delhi every week where ashtanga yoga, classical asanas and meditation is being practiced. Yoga and Ayurveda are the branches of the same tree of Vedic knowledge that hems in the entire human life and the universe. They are sunder and still coupled to be defined as the healing disciplines of our ancient tradition, culture, science and art. Undoubtedly, the merger tantamount to a flawless system of healthiness for body, mind, and soul, medically and spiritually. Bringing the two science together and celebrating their union is Kairali, who had been organizing Kairali’s Yoga Retreat since 2013-14 in its endeavour to explain people the philosophy of two sciences at Kairali— The Ayurvedic Healing Village, Palakkad, Kerala. The latest addition to the tally are various Yoga & Ayurveda Retreat like Prav & Simona & Food Sadhna apart from annual Lakshya Yoga Retreat of 5 Nights and 6 Days. The aim is to offer you with an out-of-the-world experience where you get to experience yoga and meditation along with ayurvedic therapeutic and restorative procedures, which will help you purify and be free from the unwanted toxins. Set amidst the Pala trees, the destination is a blessing on earth. Nature welcomes you with open arms and engulfs you in its warmth taking you to the world of self-transformation and self-consciousness. With the help of yoga and ayurveda, it then helps an individual to achieve a state of health and balance, which otherwise would have seemed impossible. The experience is coupled with healthy food to satiate your taste buds and your health first.